The Hotone Tape Eko is a smart echo pedal that embodies the soul of the classic magnetic tape echo sound. 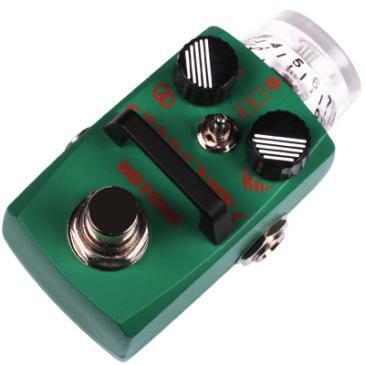 The reverse echo will literally take you back in time. 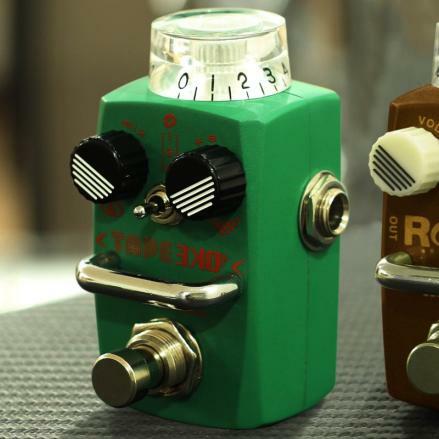 Like the rest of Hotone's characteristic range of Skyline micro-stomp boxes, Tape Eko's diminutive form masks its astonishing sound quality. Mode I gives you all the advantages of a digital delay. Compared with other tape echo effects, this mode produces a brighter, cleaner tone with less noise, all without sacrificing warmth or dynamics. Mode II differs from Mode I in terms of dynamics. These tones are much more true to the traditional magnetic tape echo machine response. The reverse mode, which models a magnetic tape machine’s playback head operating backwards, shares the characteristics of Mode I: warm and natural while maintaining clarity – It will literally take you back in time.